The fleet of twelve submarines of the United States navy has been created entirely since the war, with one exception, the “Holland” being constructed several years prior to that time. In the following year seven additional submarines, known as the “Adder,” “Grampus,” “Moccasin,” “Pike,” “Porpoise,” “Shark,” and “Plunger,” were authorized and subsequently built at results. In three&apos; runs over the mile course, using only her gasoline engines, she averaged a little over 11 knots, the first run being made at 11.6 knots. Running submerged and using only her electric motors, she made a speed of about 10 knots. In the submergence test, while going at full speed on the surface, she shifted her motive power from gasoline engines to electric motors, filled her ballast tanks, and dived to complicated in the telling, but by the use of forms and tables developed by experience it is rendered comparatively short and simple. The law of comparison as applied to ships is a special case of the general mechanical law of similitude connecting the operation of any kind of model with the corresponding full-sized object. It is applicable to machines, such as steam engines, ventilating fans, Elizabethport, N. J. The “Holland,” which was purchased for purposes of experimentation and practice, is 54 feet in length over all, of 10 feet 3 inches beam, and of 74 tons displacement when submerged. She is driven on the surface by gasoline engines of 45 horsepower, and when submerged by an electric motor of 50 horse-power. She carries one torpedo tube. The other seven submarines are enlarged and improved “Hollands,” 63 feet 10 inches in length, 11 feet lOy:! inches in diameter, and of 122y:! tons displacement submerged. The motive power consists of a 160-horse-power gasoline engine, which drives them at about 8y:! knots on the surface, and a 70-horse-power electric motor which gives them, when submerged, a speed of about 7Y:! knots. In 1904 Congress authorized the construction of four additional submarines of much greater size and efficiency. Three of these, known as the “Cuttlefish,” “Tarantula,” and “Viper,” are of one type, the “Octopus” being larger than the others. Although they follow broadly the general design of the earlier boats, they are much more powerful, have a wider radius of action, are of greater structural strength, of higher speed, and possess superior maneuvering qualities. The a depth of 20 feet in 4 minutes and 20 seconds. In the test of the automatic devices for blowing the ballast in order to allow the boat to come to the surface in case of accident, she rose from a depth of 40 feet in 43 seconds. In the twenty-four hours&apos; submergence test in 30 feet of water, she carried down a crew of sixteen men, and came to the surface next day with the men in good condition. The “Octopus” has been tested as to strength and watertightness by actual submergence to a depth of 200 feet-. SIMPLE EXPLANATION OF MODEL BASIN METHODS. (Continued from page 418.) ried on in open water, unless model basins in the future are built of much greater dimensions than those now existing. In the particular case we have been considering, the wetted surface of the ship was 38,230 feet. The coefficient of friction for a ship 500 feet long in salt water is from Tideman&apos;s tables 0.00904 and the 1.83 power of 20, the speed of the ship in knots, is 240.37. Hence, the frictional resistance in pounds is 38,230 x 0.00904 x 240.37 &equals; 83,100. The total resistance at 20 knots is, then, 207,000 pounds. As a rule, since the practical application of model basin results is in connection with power, we wish to calculate -not screw propellers, and others. It is necessary, however, that certain conditions be satisfied, the essential conditions as regards the motion of liquids being that the motions should be similar and that the pressures at corresponding points should be in the same ratio as the lineal: ratio between model and ship. This condition is fulfilled as regards the waves created by models and ships, careful observations and comparisons having shown that they correspond very closely, indeed. Fig. 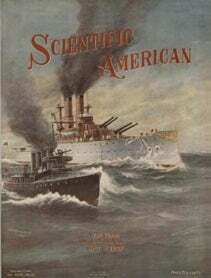 2 shows, for instance, the wave line, forward and aft, as measured against the side of a large United States battleship on trial and the corresponding wave line deduced from model experiments in the United States model basin. The coincidence is seen to be close, being practically exact as regards length of wave and within the limits of error of observation as regards height. On the actual ship the extreme height of the bow wave forward is some 16 or 17 feet above still water, while the height of the bow wave of the model at corresponding speed was only about 8 or 9 inches. There generally seems to be a slight tendency for the bow wave forward to be a shade lower than would be indicated from the model experiments, while the wave as measured aft is a little higher; but generally there is so much broken water aft on the full- sized ship that the wave is measured high. In the case of the waves the uniform pressure of the atmosphere has no effect upon the result. Practically the same wave would be created if model or ship were running ip a vacuum. When it comes ti eddy resistance, however, the case is different, particularly eddy resistance around submerged objects, such as struts. Here the pressure of the atmosphere results in the fluid pressure at any given point of the model being much greater than it should be to correspond with the fluid pressure at the corresponding point of a full-sized ship. This excess pressure may prevent the formation of eddies in the case of three submarines of the “Cuttlefish” type are about 80 feet long over all, 12y:! feet in diameter, and displace 175 tons. On the surface they are driven by gasoline engines at a speed of 10 knots, and in the submerged condition the electric motors have driven them over the mile course at a speed of 9 knots. They are supplied with a submarine bell signal system for communication with the surface. They submerge by filling various ballast tanks distributed throughout the boat. The reserve of buoyancy when in diving trim is from 500 to 1.000 pounds. To navigate the boat submerged the propellers are started, and by means of the diving rudders, which are turned downward, the axis of the vessel is inclined by the bow from 5 to 10 degrees. To maintain submergence after reaching the desired depth the diving rudders are shifted and the boat is thus held at the required depth. The process of diving is as follows: Water is admitted to the ballast tanks until buoyancy is reduced to the desired degree, which is generally between 500 and 1,000 pounds. The propellers are started and the diving rudders put down, the vessel descending on a downward incline. To return to the surface the diving rudders are put up, the boat traveling to the surface on an upward incline. The trials of the “Octopus” lately carried out by a special trial board of the navy gave very gratifying resistance, but what is known as effective horse-power ; that is to say, horse-power which would be absorbed by the resistance at the speed of the ship. In the case in hand, for instance, the resistance at 20 knots is 207,000 pounds. A speed of 20 knots is a speed of 2026.6 feet per minute. Hence, the resistance will absorb 419,500,000 footpounds per minute and the effective horse-power would 419,500,000 beor 12,700 in round numbers. 1Jf. 1*1 l r 33,000 The process described above may seem somewhat The “ Octopus” Diving. THE DEVELOPMENT OF OUR SUBMARINE FLEET. the model which would appear if the fluid pressures were reduced to correspond to the pressures around the full-sized ship. This would not be the case behind a square stern-post, for instance, because the area in rear of this would be full of eddies for either model or ship. But w.e might have cases where eddying around (Continued on page 433.) L.JL A R.H RAP\ D &apos;C&sol;l LC U LAT\Q Young Man, Are You Quick at Figures? This is one of the questions the prospective employer will ask you. Haven&apos;t you heard in your own experience something like the following—” Give Mr. So and So a show-he&apos;s the best man in the office,” or “Send for Jones"-"he is good at figures." What is stick a reputation worth to you when a valuable vacancy occurs in the store, shop or office f Don&apos;t put off another hour to write for our Free Book. “ Rapid Calculation.” Every day&apos;s start may mean dollars; you don&apos;t put off eating until you starve; don&apos;t put off writing until all the ambition and hope are starved out of you. Address COMMERCIAL CORRESPONDENCE SCHOOLS 89011 Court Bldlr., Rochester, N. Y. “THE SCHOOL OF PROSPEROUS GRADUATE!!." VENTRILOQUIS M !irned by any Man or Boy at Ome. Sull cost. Send to-day 2-cent stamp for particulars and proof. O. A. Smith, Roomo5!,U40 KnoxvlUeAve., Peoria, III. Four Cycle Marine Engines Guaranteed steady and reliable under all weather conditions. Jump Spark Ignition, Auto Type. Built from 3 H. P. single cyl. to 20 H. P. four cyl. in High Speed Engines. BUILT TO RUN AND THEY DO IT Our Heavy Duty Slow Speed Engines, 7 H. P. single cyl., 14 H. P. double cyl.. 28 H. P. four cyl.. 45 H. P. four cyJ.. are guaranteed to develop their H. P. rating at slow speed. Send for Catalog No. 30. Free. Write to-day, REGAL GASOLINE ENGINE CO. 62 W. Pearl St., Cold&apos;Water, Mich. r* We&apos;ll Send You This Velvac Razor Strop for 30 DAYS FREE TEST OWith this strop you can always keep your -razor edge in perfect shavin;. :--&apos;&apos; shape." ]&apos;flits strop is made on a new aud scientific principle. The leather is all smooth-andven-fibered, fine- grahied colt-skin. The sharpen side is treated by our special oil- filling process—whichabsolutely ciosts the pores —:iud prepares the surface so that drawing the razor over it founs vacuum or suction. This vacuum holds th.. razor-blade dose to the surface, nnd produces an exceedingly keen, tsliiirp cutting edge. Then .a few strokes on the whet-like surface of the finish siie tf the strop puts your razor in condition to remove the tourhest and wiriest beard without a bit of piilllng or 8cratching. The velvet-finisher an d the vacuum sharpen er give us the name— VELVAC RAZOR STROP Now, w e don&apos;t ask you t o take this razor just on our “ say-so. "— We want you to provc-itwOiit to your own satisfaction— We&apos;ll send veil a Velvac Razor Strop postage prepaid, upon receipt of price. You can u.&percnt; it 30 days—then If you don&apos;t find it just as we say—send it b:uk and we will refund your money without a word. Velvac Razor Strops .are made in two sizes— 2x19, ei.i&apos;5, and*1.50. Wiite to-day for free booklet, “ Hints on Easy Shaving.” SEALSKIN SW ATY STROP CO. 168 West 2d Street, Ottumwa, iown Valuable Books Home Mechanics for Amateurs This book bas achieved anunparalleled success In one week, and a Special Edition of 4,(X copies has been ordered. It Is by far tbe largest and best book on the subject ever offered at such a low price. It tells bow to make things the right way—the “ only “ way —atsmauexpense. It will prove of value to you- much more than you realIze. Do things with your hands. Send for a circular giving co ntents-th e circulars cost only a cent- the book &dollar;1.50 postpaid. If the book could men face to face you would be the first to purchase. The first large edition is almost gone, ord er to-day. 1 *- Ill If HOME MECI-l AN1CS for AMATEURS rBf lot. HOrK! -mmm, sgZTf*is5 fetrsbfU anuria* ""i L1 31&apos;0 Pages :«6 Engravings Price SI.50 REVISED aiid ENJ,ARGED EDITION The Scientific .American Of Receipts Notes and 5 Queries. V 15,000 Receipts. 734 Pages. Price, SIi.OO in Cloth. 86.00 in Sheep. &dollar;6.IiO in Half Morocco. Post Free. This work has been revised an d enlarged, Cyclopedi a 900 New Formulas. The work is so arranged as to be of use not only to the specialist, but to the Keneral rea der. It should ave a pi ace in every home aDd worksnoe. A circular conta ining f u 11 Table of Contents will be sent on application. Those who already have th e Cyclopedia m ay obtain the 1901 APPENDIX. Price, boun d in cloth, &dollar;1.00 postpaid. &apos;&sol;-&apos;LDP: MAGIC Stage Illusions and Scientific Diversions, including Trick Photography This work appeals to old and young alike, and itis oneofthe most attractive holiday books of the year. Tbe illusions are illustrated by the highest class of engravings, and the exposes of tbe tricks are. in many t prestidigitateurs th em- selves. Conjuring. large stage illusions. fire-eating. s w o r d-swallowing. ventriloquism. mental magic, ancient magic, automata, curious toys, stag e effects, photographic tricks, and the projection of moving photo- a al scribed and illustrated, making a handsome volume. It is tastefully b knowledged bythe prg: fession to be the Stand- r By A. A. HOPKINS. 568 pages.&ilius. Price SG.AO. MUNN “ CO., Publishers, 361 Broadway, NEW YORK ELECTRICITY is the most wonderful power of the present day. Master it, and you have mastered the best-paying calling of this 4 4 live-wire “ &apos; century. We teach Electricity practically in our seven-story school building, the most completely and expensively equipped of its kind in the world. Booklet &apos; 4 K” FREE. Write for it TO-DAY. Eighty pages that are richly illustrated and deeply interesting. NEW YORK ELECTRICAL TRADE SCHOOL, 39 W. 17th St. Address Envelopes with a simple machine, 3,000 per Hour. 3c. per Thousand Fac-simile of Typewriting&apos; like business correspondence. Also addresses tags, statements, invoices, bills of lading, notices, receipts, record blanks of any kind—anything— everything. 30,000 Addressographs in Use Write To-day for indestructible printing plates and catalog. ADDRESSOGRAPH CO., 232 W. VAN BUREN ST., CH C GO Use Beaver Boards Instead of Both Lath and Plaster Sold all over the United States and at export on merit that wins repeat orders. POSITIVELY THE IDEAL WALL AND CEILINC MATERIAL Made from pure wood fibre pressed into solid panels —Nail direct to studding. doing away with lath, plaster and wallpaper - Take any tint or color, giving exquisite artistic effects—Insulate and deaden sound-Make buildings warm in winter, cool in summer. Investigate before building. Finish off your third floor or cottage and be convinced. They speed construction and save money. Six Kind.. I Beaver Flnl .. hed Wall Boards Beaver Fire-Proof Boards Beaver Indurated Boards Beaver Veneered Panels Beaver Coated SldlngBeaver Feldspar Sldln& Our handsome, illustrated Beaver Booklet tells all about them ; free with sample for the askiug. The Beaver Manufacturing Co., General Offices,2?8 Perry St., Buffalo, N.Y. Otowqo DesiiDe Exterior. We build Portable Houses any design to order. Otowego Design. Interior. Attractive and Substantial. Write for information on Beaver Portable Houses. WEBB FLEXIBLE SHAFTS Can be tied in a knot and still give efficient service. They are unequalled for flexibility, strength, and durability, have no back-lash and do not heat up. Supplied in any lengths de&lowbar; sired, and in sizes from 54 inch to &percnt; inch. Buffing and grinding attachments and wire belting also a specialty. Prices, etc., on request. WEB MOTACTG CO., - - Newark, N. J.. WATERMAN CANOE MOTOR Small, neat, complete. Standard type, 2H.P Weight&pounds. Drivel canoe 10to 12mUes an hour. Gray iron cylinder. Spun copper jacket. Aluminum crank rase. Float-feed Carbureter. Shipd complete, including foundation. Ready to put in canoe. Immediate delivery. Send for catalog. WATERMAN MARINE MOTOR CO. 1509 West Fort St., Detroit, MIch., U. S. A.